Follow @museumoficecream on Instagram or sign up for their mailing list. That way, you'll know the dates and times they release tickets. Plan ahead. Once you know the ticket release dates, enter them into your calendar and set a reminder. Log on 10 minutes ahead of time to make sure that the ticketing software adds you to the queue exactly at opening time. I also used multiple computers. Have an American Express Platinum Card. Amex Platinum card holders got first dibs on tickets during a pre-sale, 2 days before the general sale. Amex regular card holders got their turn the day before the general sale. Have a few dates and times in mind, so that if your first choice is not available, you can immediately click on your second (or third) choice. Consider going on a weekday to maximize your chances of getting tickets. If you don't get tickets in the presale, don't despair. There are many more tickets available on the general sale date. Tickets are not transferrable. Each ticket holder must be named when purchasing the tickets but only 1 person must have ID to match one of the names. 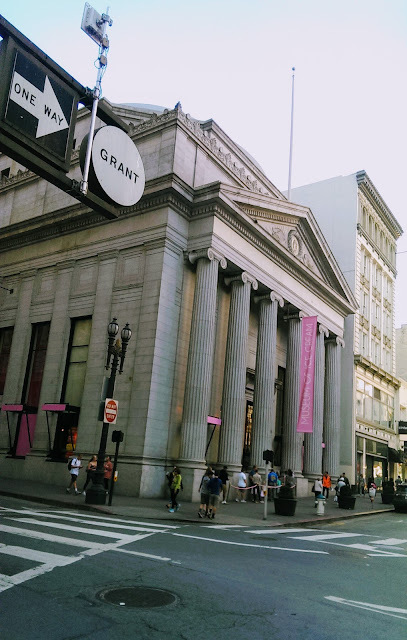 The Museum of Ice Cream is located at 1 Grant Street in San Francisco. The closest large parking garage is at 5th and Mission. Try to get there before your scheduled time because you will have to line up outside the building. 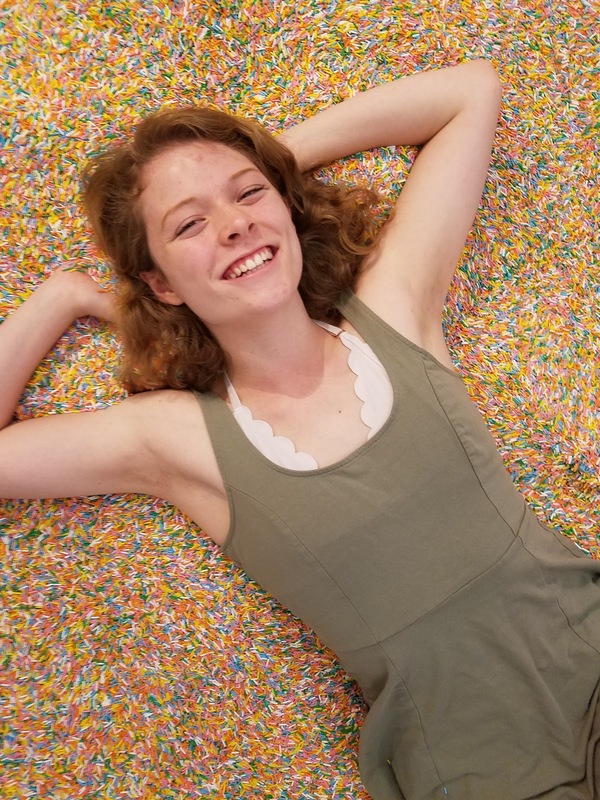 The Museum of Ice Cream (MOIC) is basically an interactive, photogenic playground. 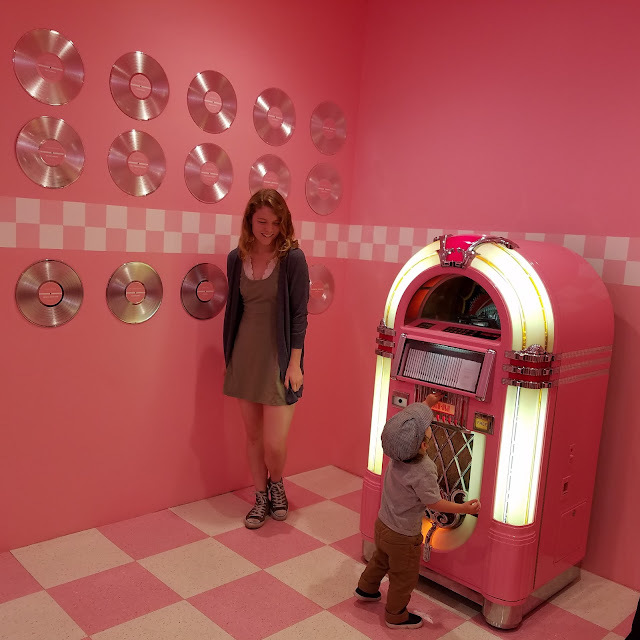 Upon entering each room, each visitor does two things: plays with the interactive component of the room, then takes a photo or video. 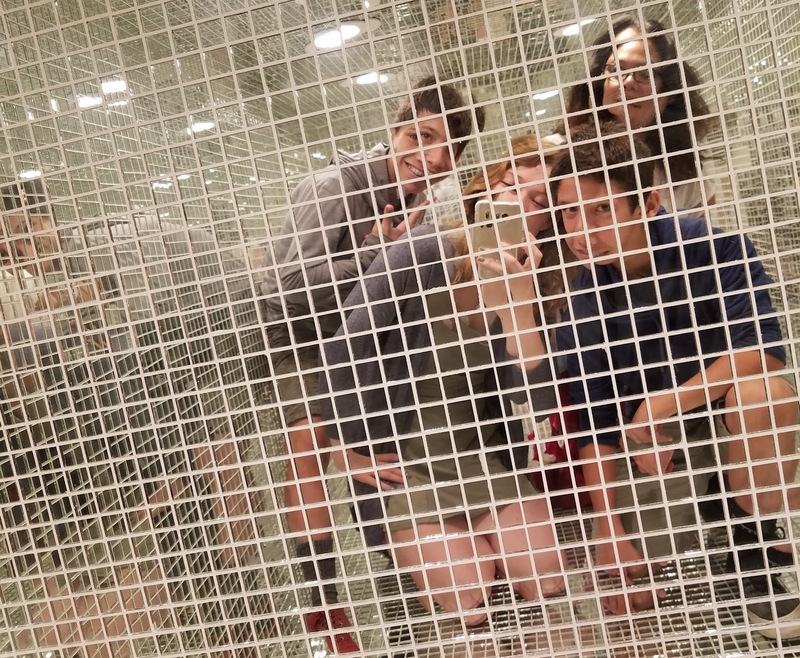 You can tell that a millennial is the brainchild behind MOIC: the exhibits are tailor made for the selfie generation! 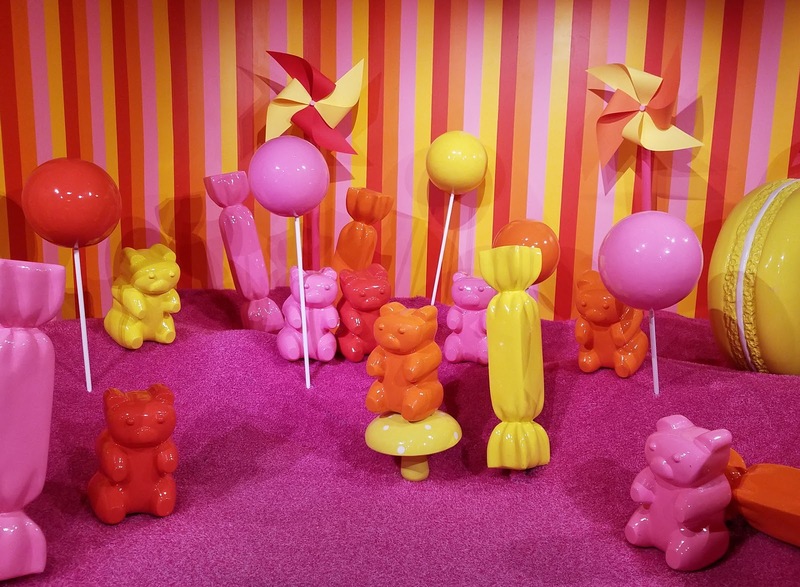 Each exhibit features eye-popping colors, fun props, and cute themes. In other words, each room is designed to be the perfect backdrop for that perfect photo for your Instagram feed or Snapchat story. 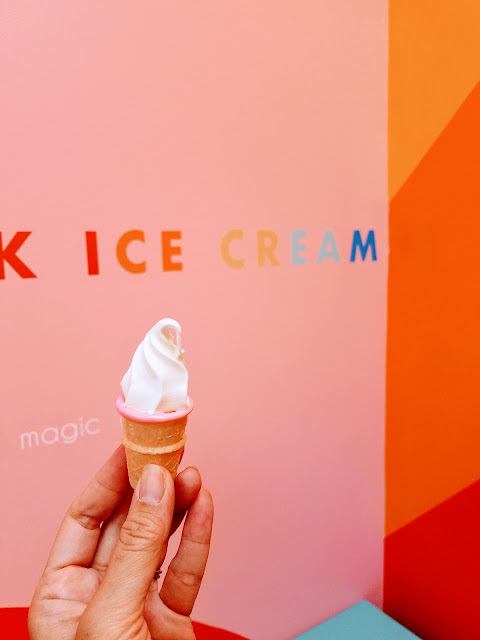 Unlike most museums, the Museum of Ice Cream is designed to be interactive. 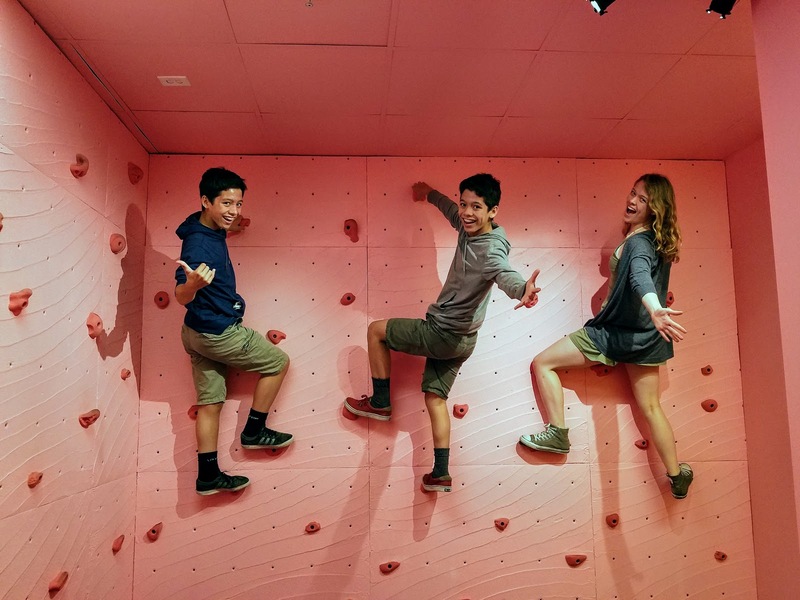 There are a few objects hanging from the ceiling that attendants ask you to be careful with, but for the most part visitors are encouraged to touch and play. 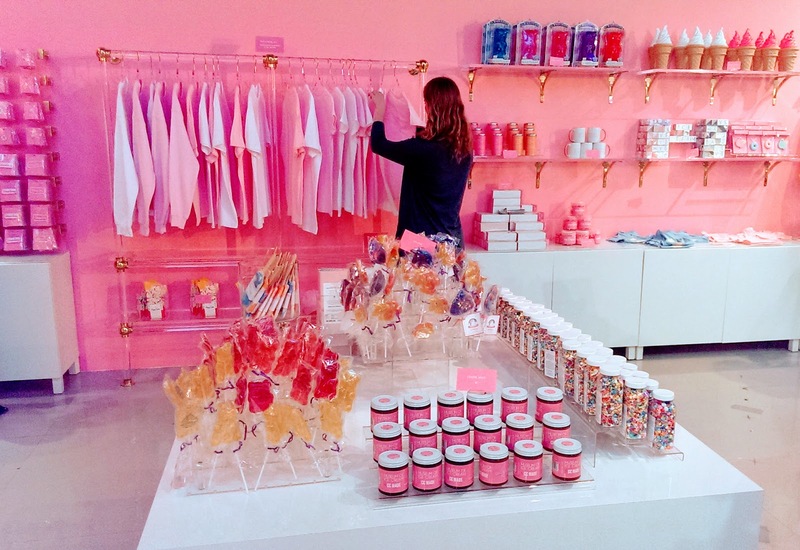 The walls are lined with taffy and the floor is scattered with carnival tickets in this all-pink room. Visitors can play a ring toss game and record a video of themselves in the room. This room is designed to resemble a fifties diner, complete with chrome stools and working jukebox. Visitors receive ice cream samples. 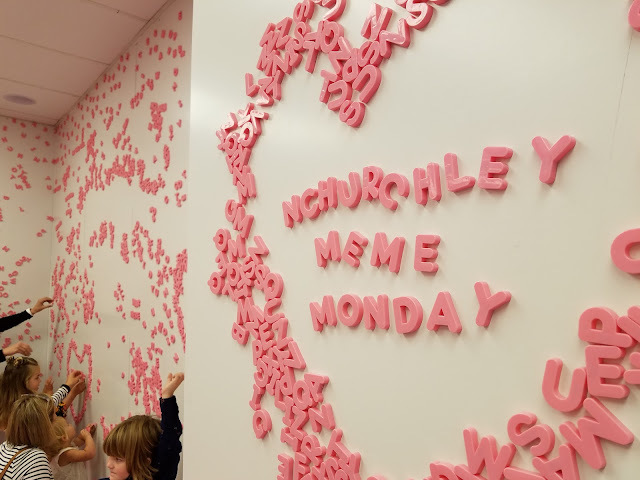 Visitors can spell out messages on the white magnetic walls using pink letter magnets. An attendant in the corner hands out samples of mochi ice cream. Enjoy cherry flavored cotton candy sprinkled with edible glitter as you make your way through a room filled with clouds and cherries. This garden of giant colorful gummy bears and lollipops reminds me of the iconic scene from Willy Wonka. 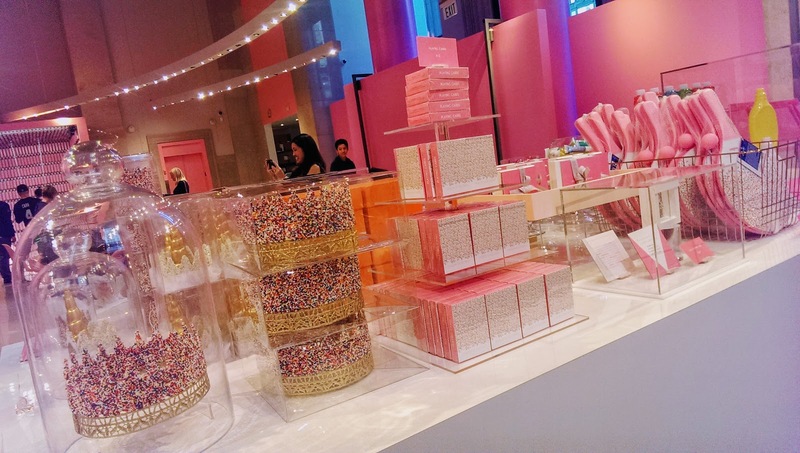 The floor and walls are covered with ice cream treats. 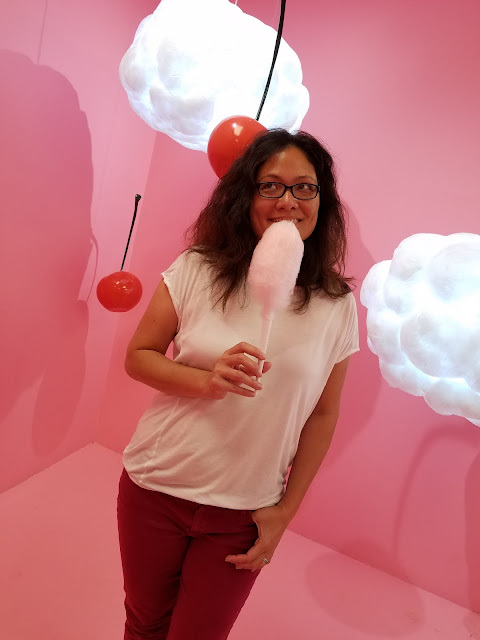 Visitors can sit on giant popsicle benches and record a video of themselves in the room. 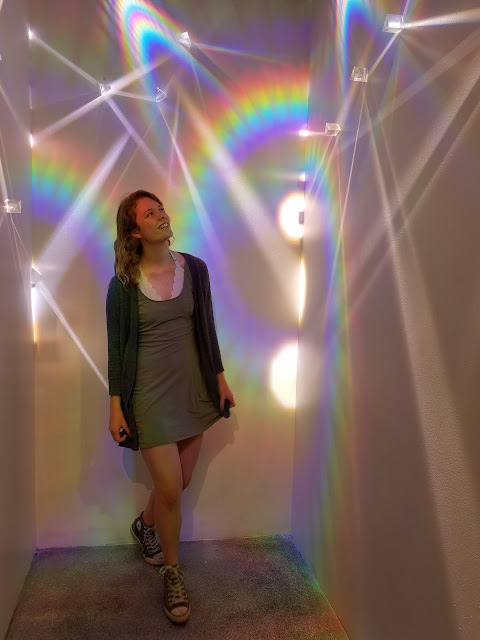 This small anteroom features beams of light and strategically placed prisms. Not sure what this has to do with ice cream, but it's really cool. 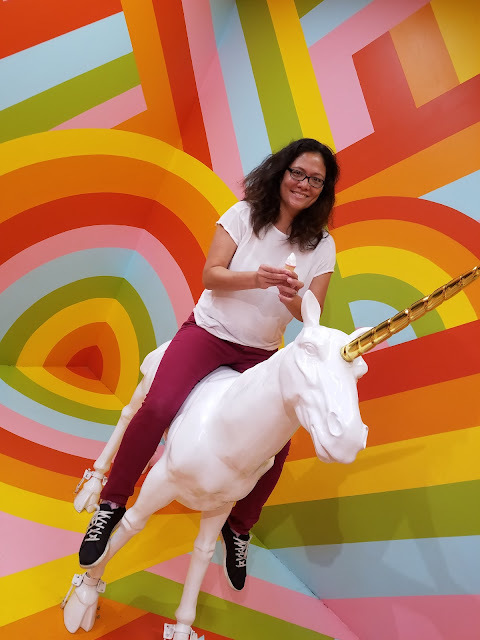 The centerpiece of this psychedelic room is the white unicorn, which of course everyone wants to ride. While you're waiting for your turn, sample a mini vanilla soft serve featuring a candy-dipped cone. Crawl into this tiny room which is covered floor to ceiling with mirrored tiles. The lighting here is awesome! This small anteroom to the rock cave features hand and foot holds and a padded floor. Again, not sure what this has to do with ice cream, but the kids loved it. Inspired by rock candy, visitors can sit on the rock candy bench and munch on Pop Rocks. 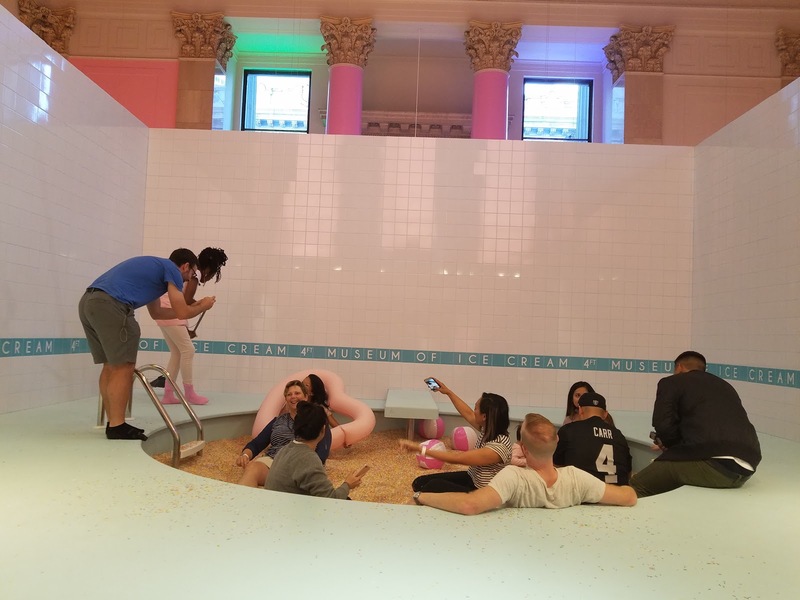 Each installation of the Museum of Ice Cream -- in New York, LA, and San Francisco -- is unique, with different rooms and different sampling opportunities. However, they do have one thing in common: the Sprinkle Pool. 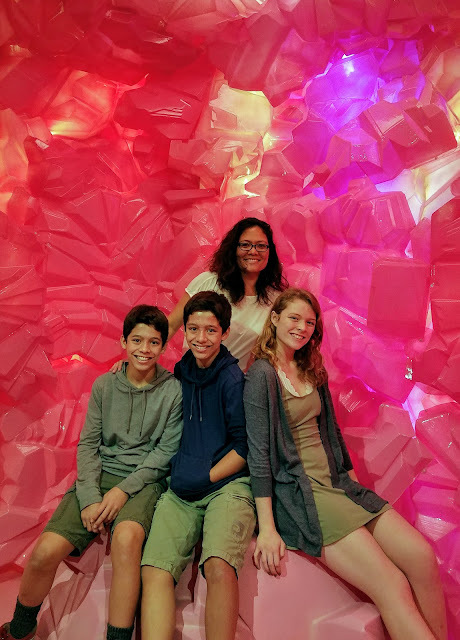 It's the highlight of the museum because aside from being an amazing photo opp -- the high ceilings let in lots of natural light -- it's a lot of fun. The pool is the ultimate interactive exhibit. 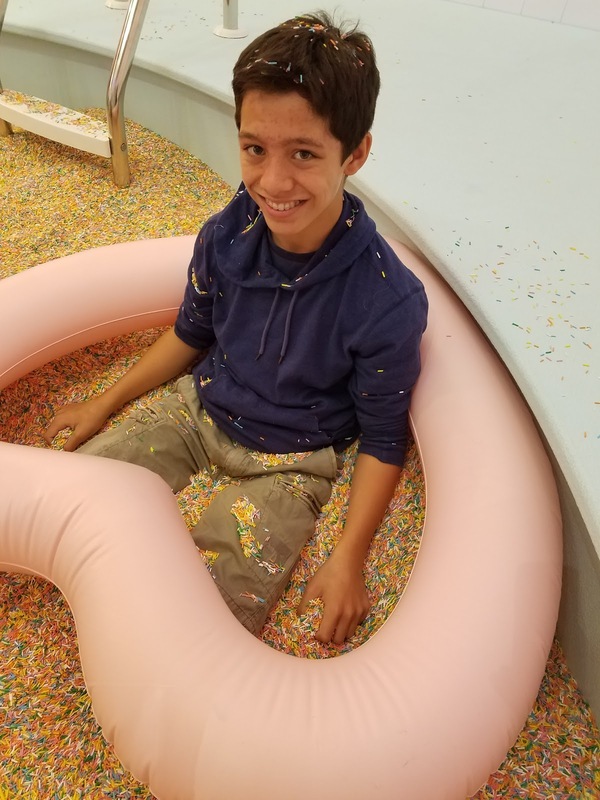 You're not allowed to dive in, but it's deep enough to immerse yourself in sprinkles. 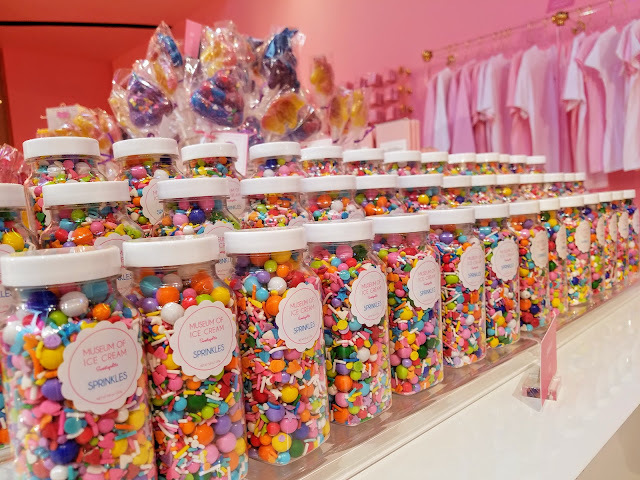 It's difficult to resist grabbing a handful and throwing them up in the air, and letting sprinkles run through your fingers is so oddly satisfying. Afterwards, you can head to a "shower" room where you blast yourself with air hoses to dislodge any sprinkles. The sprinkles are plastic, not candy, so they're not sticky, but it's surprising how many of them manage to worm their way into your pockets! The Sprinkle Pool is so popular that it's the one room where attendants control entry and exit. They let in groups of 10-12 and give them about 5 minutes to swim in the sprinkles and take selfies. As you can see from the photo, the pool is actually quite small, so it can be challenging to take a photo without any stray feet or faces. It's the one room where I felt somewhat rushed, but I do understand the need to keep things moving, otherwise people would spend all day in that pool! 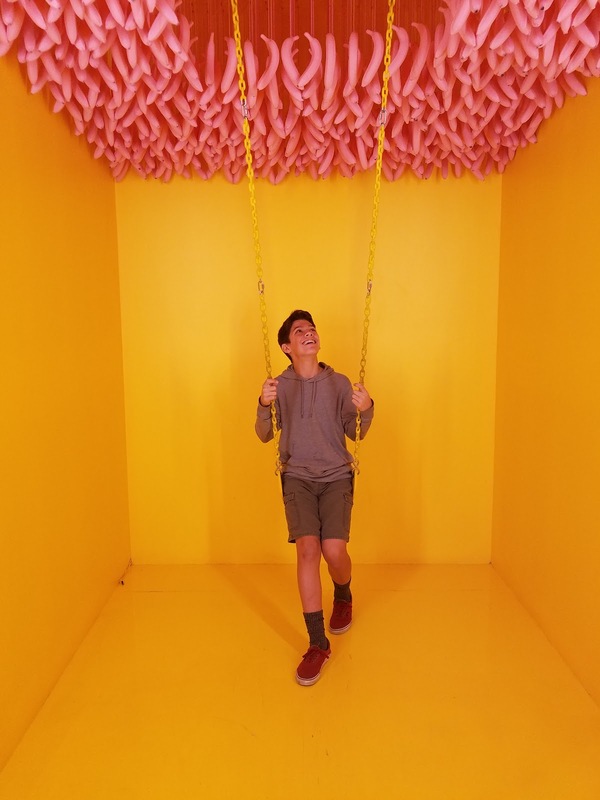 The final exhibit features 3 swings with varying backdrops. Visitors can really let their inner child out and swing to their heart's content (or until the next visitor wants his turn). We received five samples: a scoop of gingersnap ice cream with strawberry syrup, mochi ice cream, cherry cotton candy (the best cotton candy I've ever tasted) with glitter sprinkles, pop rocks candy, and a mini soft serve vanilla cone. Serving sizes are just right, small enough to whet your appetite but not large enough to ruin it if you plan to have lunch or dinner afterwards. The gift shop at the end sells all kinds of cute ice-cream themed merchandise such as t-shirts, books, magnets, umbrellas, tote bags, tumblers, lip gloss, candy, and sprinkles. The Pea treated herself to a sweatshirt with a tiny embroidered ice cream bar logo. At $35, it cost less than I would have thought, and she was thrilled with it. Visitor flow moves in a 1-way direction; that is, you can't go back to the previous exhibit. There are restrooms along the exhibit route but I don't remember seeing a water fountain anywhere. Give yourself at least 45 minutes to 1 hour to get through the exhibit, but don't let anyone rush you through the exhibits. It took us just over an hour and a half, including time browsing through the souvenir store. Enjoy your time in the exhibits, but be courteous to your fellow visitors and don't hog the best backdrops. Plan your outfits! I loved seeing little kids and grownups in pastels and bright solid colors. Even jeans and a white tshirt will look great against all the backdrops. The souvenir shop does not accept cash, just credit cards.